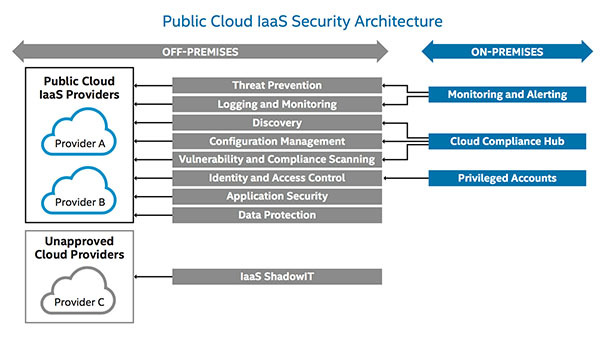 Recently, Intel IT has developed a public cloud infrastructure-as-a-service (IaaS) security strategy, which also encompasses platform-as-a-service (PaaS) security. This strategy, complemented by a comprehensive IaaS security architecture, enables Intel business units to use public cloud IaaS to accelerate innovation and time to market while cutting costs. Successful public cloud usage involves more than just technology. We have adopted new tools, made substantial enhancements to relevant processes, and invested in people’s skill sets. We have found that we must regularly invest in developing our IT skills to securely enable Intel’s growing number of public cloud IaaS use cases. Our long-term public cloud IaaS security strategy enables us to apply a compliance process not just to individual IaaS components but also to the entire cloud security configuration. We continually assess and enhance security and privacy capabilities, processes, and people’s skills to protect Intel’s data and the data of our customers.